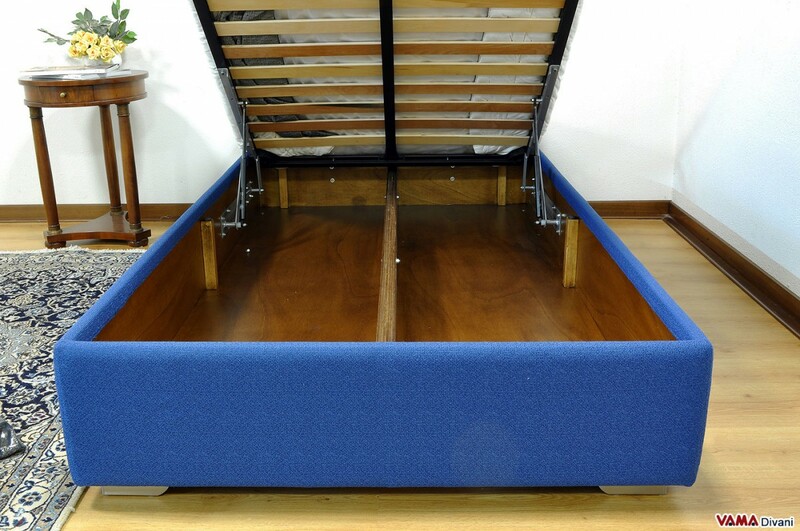 The French bed is defined as an intermediate size between the "Queen" size and the double bed, that provides a special size in its 140 cm width, thanks to this feature, the Sommier bed can be used both as a bed for two people and as a quite spacious single bed. A versatile model that is perfect in different contexts, and that allows you to save a lot of space thanks to its large storage box, which is entirely made of plywood to ensure the best durability, in the pictures, you can notice the use of the wood for the whole storage box. This French bed with storage box can be customised in any detail by your choice. The Sommier French bed (thus without headboard) is a model characterised by a simple and versatile style, which is suitable to be combined with very different contexts. The French bed with storage box presents intermediate dimensions, which are exactly located between those of a double bed, that is with a 160 cm wide base, and those of the so-called Queen-size bed, with a 120 cm wide base; this bed, in fact, is equipped with a 140 cm wide slatted base. These particular dimensions allows the French bed to be used both as a very comfortable and spacious single bed and as a bit more intimate double bed, maybe to be placed in a smaller bedroom. It could even be considered as a comfortable bed for two children or teenagers. 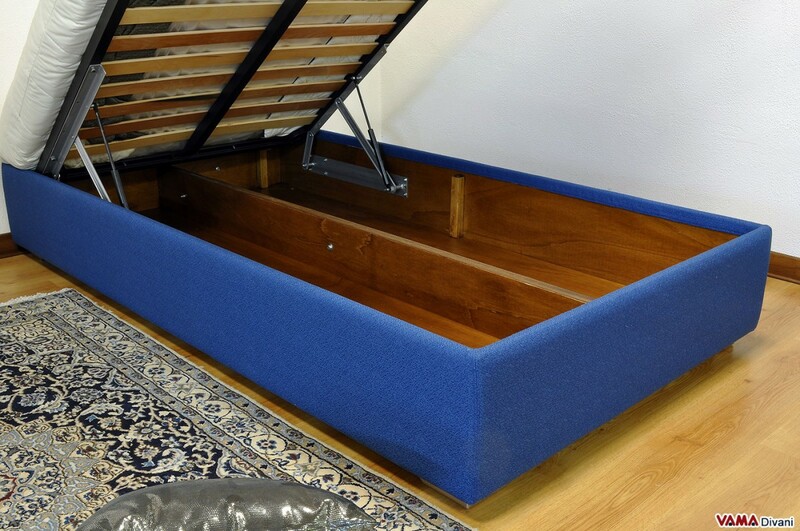 This bed, also available without storage box, can be customised in any fabric colour, any type of foot (wheels are even available, in order to move the bed easily), and any type of padding. 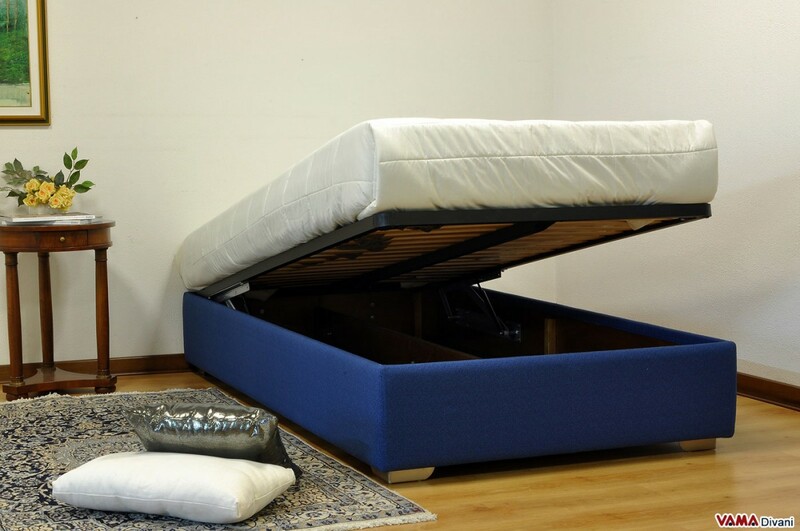 It can be customised in any size, because we can change all its dimensions, starting from the width and the length of its base to the height of its bed frame. Get your custom French bed. VAMA Divani can realise for you even quilts of a special colour or with a specific pattern, and at the same time, you can choose and buy on-line, in this e-commerce store, your French bed with the mattress of the same size, so that you will enjoy an absolutely complete bed, ready to be used. Our handicraft company allows us to realise even the custom French bed according your special requirements, such as a lower bed frame than the standard one. Just select the different options to calculate the right price of the French bed. For example, you can choose a faux leather French bed with storage box, once you have selected the options you want, the price will appear automatically, in this way you will know all the prices of the different available models of the French bed. If you are interested to a French bed with wheels, you will have to select the steel feet, as they are included in this category.